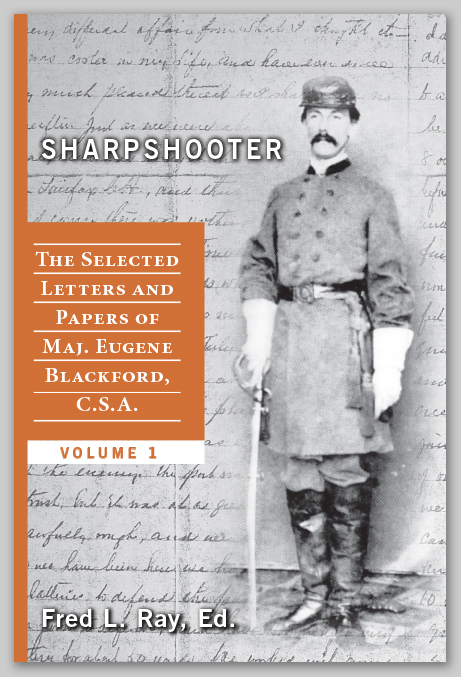 American Civil War Books :: Sharpshooter - The Selected Letters and Papers of Maj. Eugene Blackford, C.S.A. SHARPSHOOTER: The Selected Letters and Papers of Maj. Eugene Blackford, C.S.A. Eugene Blackford was an aristocratic young Virginian who served throughout the Civil War and wrote about much of what he saw. A prolific correspondent, his remarkably complete set of letters spans most of the war and provide a unique opportunity for the modern reader to see the conflict in Virginia through the eyes of someone who lived it. Blackford left vivid accounts of the battles at First Manassas, Seven Pines, Gaines’s Mill, Malvern Hill, Chancellorsville, Gettysburg. He also described the 1864 Shenandoah campaign, including the raid on Washington; the battles of Second Kernstown, Third Winchester, and Cedar Creek; and a host of smaller actions. The battles, however, are only a part of the story. Blackford also wrote about camp life, food, foraging, the hardships of the picket line and the marches, and much more. He makes candid, often acerbic, comments on his leaders at all levels, and is not shy about criticizing the ones he finds wanting, such as Earl Van Dorn, D. H. Hill, and Jubal Early. He is, however, unstinting in praise of those he admires, especially generals Robert E. Lee and Robert Rodes. Blackford and Rodes, both Virginians serving in an Alabama regiment, formed a friendship early on that was severed only by Rodes’s death at Third Winchester in the fall of 1864. Blackford also gives the modern reader a rare inside look at regimental politics–the competing personalities, the elections, and the jockeying for rank and position. Although usually portrayed after the war as selfless bands of brothers interested only in serving their country, Civil War regiments were often anything but. Many of their officers were strong-willed, ambitious men: captains who wanted to be colonels, and colonels who wanted a general’s stars. This hunger for advancement often put Blackford, who was genuinely devoted to his duty and as a gentleman disdained the grubby business of politics, at a disadvantage. The bad blood that developed between Blackford and another of his superiors eventually led to his being court-martialed and cashiered for trumped-up charges of misconduct at Cedar Creek in the fall of 1864, which was followed by a lengthy and ultimately successful effort for reinstatement, although the war ended before Blackford could secure the promotion he sought to lieutenant colonel. One of the most interesting and important matters Blackford was involved with was the formation and training of the Army of Northern Virginia’s light infantry sharpshooters. Blackford organized the first battalion in January 1863, at the behest of General Rodes. Drawn from the best men in the brigade and intended for scouting, screening, and picketing, the sharpshooters assiduously practiced skirmish drill and marksmanship, attaining an unprecedented level of skill and proficiency. Blackford and Rodes worked closely together on the sharpshooters, which were eventually organized as a “demi-brigade” of four to five battalions at division level. Blackford became “chief of outposts” for Rodes’s division, responsible for its security in the presence of the enemy. Therefore, his letters and diary/memoir form an invaluable source of information about these important but hitherto virtually forgotten units. They also give us a close look at general Robert Rodes, one of the army’s best combat leaders. These volumes will be released serially. The first will be published in early 2016, the rest at intervals of about one year. Author Fred Ray became acquainted with Eugene Blackford while writing his last Civil War book, Shock Troops of the Confederacy, quoting liberally from Blackford’s letters and memoir. This led to an interest in the man himself and his times, and to a search for the rest of his letters and papers.